A Guide To Successfully Set Up Lighting In Your Retail Store While good lighting solutions are necessary to attract customers and to create an inviting shopping experience, a messy and cluttered environment can ruin customer experience and prevent them from visiting your place again. Retail lighting such as LED lighting solutions can be broadly categorized into four main types- ambient lighting, task lighting, accent lighting, and decorative lighting. Combining the right bulb options can be beneficial to brighten your store, and to indirectly boost your sales and grow your business. 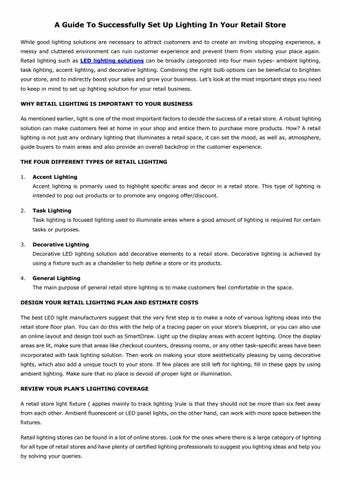 Let’s look at the most important steps you need to keep in mind to set up lighting solution for your retail business. WHY RETAIL LIGHTING IS IMPORTANT TO YOUR BUSINESS As mentioned earlier, light is one of the most important factors to decide the success of a retail store. A robust lighting solution can make customers feel at home in your shop and entice them to purchase more products. How? A retail lighting is not just any ordinary lighting that illuminates a retail space, it can set the mood, as well as, atmosphere, guide buyers to main areas and also provide an overall backdrop in the customer experience. THE FOUR DIFFERENT TYPES OF RETAIL LIGHTING 1. Accent Lighting Accent lighting is primarily used to highlight specific areas and decor in a retail store. This type of lighting is intended to pop out products or to promote any ongoing offer/discount. Task Lighting Task lighting is focused lighting used to illuminate areas where a good amount of lighting is required for certain tasks or purposes. Decorative Lighting Decorative LED lighting solution add decorative elements to a retail store. Decorative lighting is achieved by using a fixture such as a chandelier to help define a store or its products. General Lighting The main purpose of general retail store lighting is to make customers feel comfortable in the space. DESIGN YOUR RETAIL LIGHTING PLAN AND ESTIMATE COSTS The best LED light manufacturers suggest that the very first step is to make a note of various lighting ideas into the retail store floor plan. 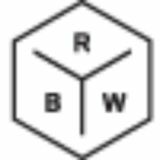 You can do this with the help of a tracing paper on your store’s blueprint, or you can also use an online layout and design tool such as SmartDraw. Light up the display areas with accent lighting. Once the display areas are lit, make sure that areas like checkout counters, dressing rooms, or any other task-specific areas have been incorporated with task lighting solution. Then work on making your store aesthetically pleasing by using decorative lights, which also add a unique touch to your store. If few places are still left for lighting, fill in these gaps by using ambient lighting. Make sure that no place is devoid of proper light or illumination. REVIEW YOUR PLAN’S LIGHTING COVERAGE A retail store light fixture ( applies mainly to track lighting )rule is that they should not be more than six feet away from each other. Ambient fluorescent or LED panel lights, on the other hand, can work with more space between the fixtures. Retail lighting stores can be found in a lot of online stores. Look for the ones where there is a large category of lighting for all type of retail stores and have plenty of certified lighting professionals to suggest you lighting ideas and help you by solving your queries.